Whether you are looking for a back-to-nature experience in fascinating surroundings, some great museums and cultural attractions, or a chance to explore America’s Wild West legacy, you will find it all in South Dakota. 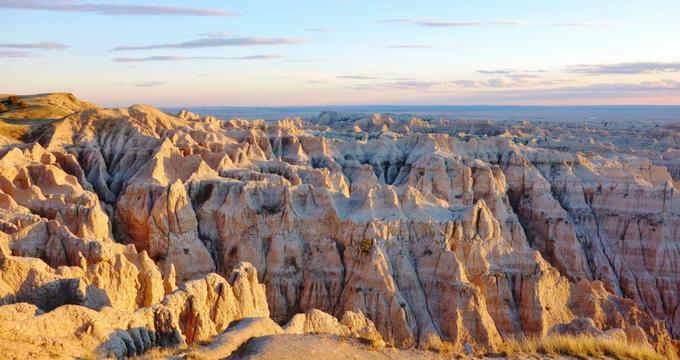 You can see some amazing rock formations in Badlands National Park, enjoy natural hot springs, visit Mount Rushmore, or enjoy museums and art galleries in Sioux Falls. 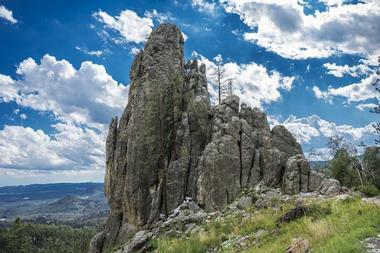 Here are the best places to visit in South Dakota. The Mount Rushmore National Monument is probably one of the most unique sites in the world, attracting over three million visitors every year. 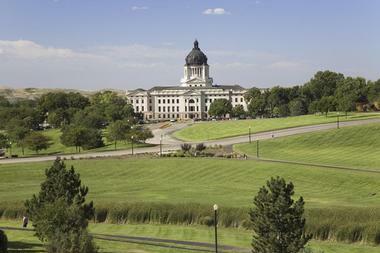 Although the monument is an American icon, most visitors know very little about how it was created – you can learn all about the history of the site at the Lincoln Borglum Visitors Center just below the Grand View Terrace where you can watch a short explanatory film and visit the Sculptor’s Studio. After you have stood in awe viewing the enormous sculptures of the country’s early presidents, you can explore the remainder of the monument on a ranger-led program, learn about early American Indian tribes, or walk the Presidential Trail to see the sculptures up close. 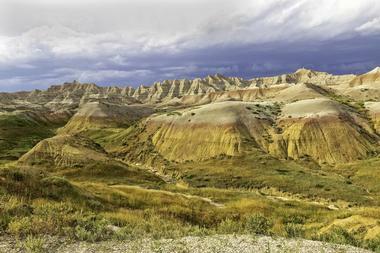 Badlands National Park sustains and protects a rugged environment of striking geologic formations that house some of the richest fossil beds on the continent. The principal activity in the park is hiking, and there are designated trails to suit all levels of fitness – you can get maps and all the info you need at the Ben Reifel Visitor Center, where children can have fun with some educational exhibits. Intrepid hikers can immerse themselves in the amazing landscape by backpacking along backcountry trails that were once the haunt of the saber-toothed cat and today support bison, bighorn sheep, prairie dogs, and abundant other wildlife species. Children can enroll for Junior Ranger Programs, and nothing beats family camping and star-gazing in the heart of the Badlands. Sioux Falls is one of South Dakota’s most diverse cities, offering visitors an attractive combination of outdoor fun, family activities, and cultural attractions. Falls Park surrounds the beautiful waterfalls on Big Sioux River in the heart of the city and has over nineteen miles of trails for hiking and biking enthusiasts. Other good recreational areas include Terrace Park and Great Bear Recreational Park, where you can ski in winter. 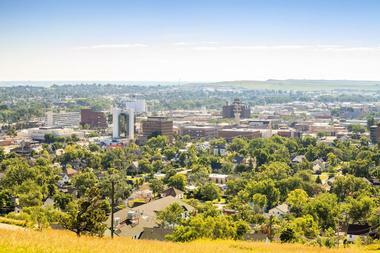 Rapid City is the gateway to some of South Dakota’s most famous attractions such as Mount Rushmore and Badlands National Park, and also has a host of city attractions to please all tastes. You can get a great overview during a narrated tour on the City View Trolley before you set off to explore the historic districts and wonderful visual arts at the Dahl Arts Center, APEX Gallery, and the fabulously eclectic Art Alley. Aberdeen beckons visitors with small-town Mid-Western charm and a variety of interesting activities for all ages. If you are visiting with children you can take them to have hours of fun at Wylie Park, which is home to Storybook Land and the Land of Oz, and the Aberdeen Aquatic Center, which features water slides and rides for all ages. 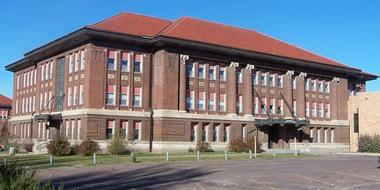 If you are looking to learn a bit about South Dakota history, you should head to the Hagerty and Lloyd Historic District, the Dacotah Prairie Museum, the Highlands Historic District, and the unique Red Cross Pheasant Canteen. 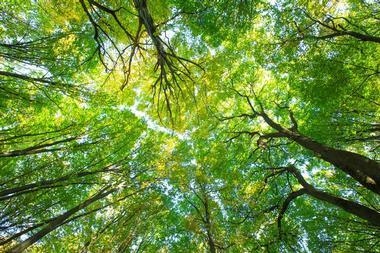 Nature lovers can spend some time at the Sand Lake National Wildlife Refuge or go hiking and biking along twenty miles of trails. The famous 1880’s gold rush brought a flood of prospectors to South Dakota, some of whom established the little town of Pierre, which subsequently became the capital of South Dakota. 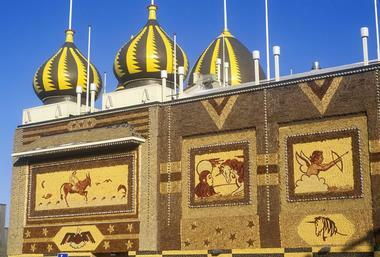 If you want to see something really different and uniquely American, you will find it at the world’s only Corn Palace in Mitchell, South Dakota. The Corn Palace pays tribute to the corn farmers and artists of the area and is a must-see attraction during your visit. You can learn all about the early days in Mitchell by visiting the Dakota Discovery Museum, the McGovern Legacy Museum, and the Prehistoric Indian Village where Native Americans were growing corn as far back as 1,100 years ago. You can enjoy strolling down Mitchell’s Historic Main Street area to discover unique shops, galleries, and restaurants or go swimming, walking, or picnicking in Hitchcock Park. In Deadwood you can step back in time to the infamous Wild West gold-rush days when a poker face and a quick draw were life-saving essentials. 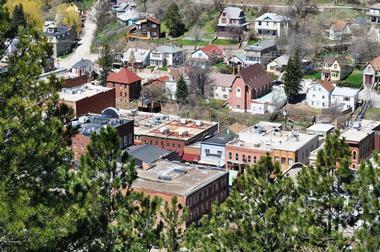 Rest assured, there is nothing dead about Deadwood, and you will find a long list of fascinating activities to keep you busy. You can walk in the footsteps of characters like Calamity Jane as you tour the restored historic buildings and watch a Shoot Out as part of a Main Street Historic Street Show. You can pan for gold in the Broken Boot Gold Mine, try your luck at one of the many casinos and gaming halls, enjoy a relaxing spa, or get out and active on miles of hiking, biking (or snowshoeing and snowmobile) trails. 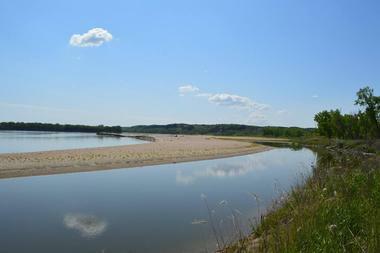 Yankton is a historic town nestled along the banks of the Missouri River in South Dakota. One of the best ways to enjoy the small-town charm of Yankton is to explore Historic Downtown Yankton where unique architecture rubs shoulders with modern restaurants, galleries, and boutiques. The town has several historic homes you can see on a self-guided tour either on foot or by car – a map is available at the Visitor’s Center. You can take a walk or cycle across the Meridian Bridge, which has been a landmark since 1924, tour some wineries, visit the Dakota Territorial Museum, or watch a summer concert in the Riverpark Amphitheatre. Outdoor pursuits include sailing, canoeing, or kayaking along the Missouri River or exploring some of the many hiking/biking trails. Custer State Park in the Black Hills beckons adventure seekers to come and explore 71,000 acres of spectacular landscape bristling with wildlife and recreational activities for all ages. You can learn about the history of the park by stopping in at the Peter Norbeck Visitor’s Center and then walk in Custer’s footsteps along the banks of French Creek, where gold was discovered in 1874. There is a long list of activities to enjoy, including scenic and wildlife drives where you may come across the resident 1,300-strong herd of buffalo. You can go hiking, biking, or horseback riding along miles of trails, go trout fishing on several lakes, and have a great family camping experience in one of the many campgrounds. 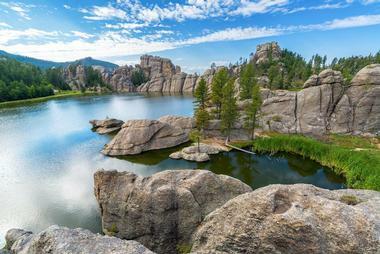 Sylvan Lake is situated in the heart of the Custer State Park in the Black Hills, surrounded by impressive rock formations and beautiful forests. The lake is a popular recreational area featuring many activities and choice camping in the picturesque Sylvan Lake Campground. Visitors can also check into the Sylvan Lake Lodge. You can spend your days relaxing on the lakeshore, do some bird watching, or get as active as you like. There are several hiking trails that lead to impressive lookout points, and if you prefer, you can join a guided geology walk to learn how this impressive landscape was formed. The lake is ideal for fishing, swimming, and boating, and you can rent a paddleboat on site. 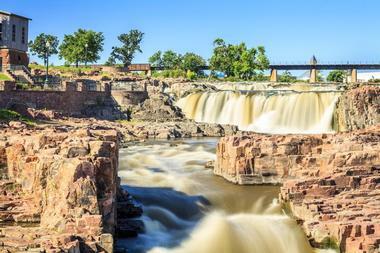 Falls Park is situated at the heart of Sioux Falls, where the cascading falls of the Big Sioux River have fascinated generations of locals and visitors and have shaped industry and commerce in the city. Today Falls Park covers over 123 acres that you can explore on foot (or by bike or rollerblades) along the Big Sioux River Greenway trail, which starts in Falls Park and meanders through several city parks. Within Falls Park, you can visit some really old industrial buildings, including the remains of the seven-storey Queen Bee Mill (1881) and the old Light and Power Company Building that now houses the Falls Overlook Café. If you are planning to visit Mount Rushmore National Monument or Custer State Park, you owe it to yourself to make the time to drive Iron Mountain Road (aka 16A), the stunningly scenic 17-mile road that joins these two attractions. To better appreciate this historic engineering marvel and the dramatic views that unfold along the journey, you should try to do the drive in both directions. You can call in at the Iron Mountain Road Store to get a map and directions and then set off to leisurely explore 314 curves, fourteen switchbacks, and some of the best scenery in the state. Along the way, you will get the chance to see the famous Mount Rushmore sculptures perfectly framed by the one-lane tunnels, and you could come across large herds of grazing bison. 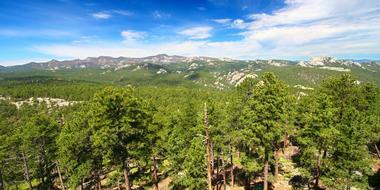 Black Hills National Forest beckons all nature lovers and adventure seekers to come and explore over 1.2 million acres of forested mountains – an area over 100 miles long and 70 miles wide. To fully appreciate this amazing recreational area you need to spend at least a few days there – you can rent a cabin or bring your tent or RV and enjoy one of thirty campgrounds. You will find yourself surrounded by lakes and streams, forests, canyons, and rugged rock formations, all begging to be explored. Hikers have a choice of dozens of day-hiking trails, or they can set off to backpack the backcountry trails. Other activities include mountain biking, rock-climbing, horse-back riding, fishing, wildlife viewing, and boating. Needles Highway (SD HWY 87) is a National Scenic Byway in the heart of Custer State Park in the Black Hills, and it appeals to all nature lovers and photographers. The remarkable 14-mile highway winds through some of the most scenic landscape in the park, twisting and turning its way through enormous granite spires (needles). Be prepared for sharp turns, low tunnels, and amazing views. Your drive along Needles Highway will take you past Sylvan Lake (where you can stop off for a picnic or a swim) and the aptly named Needle’s Eye, an opening in the rock formation caused by centuries of wind, rain, freezing, and thawing. Needles Highway is only open in summer and is meant to be enjoyed at a leisurely pace, so you need to allow enough time (at least an hour) to navigate the 14 miles. 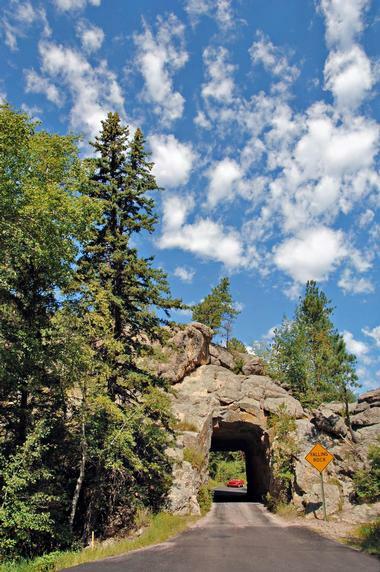 The Spearfish Canyon Scenic Byway meanders through a deep, narrow gorge along the northern edge of the Black Hills, beckoning visitors with tempting views of interesting geology, rock formations, streams, waterfalls, and plentiful wildlife. Your scenic drive will take you along the edge of Spearfish Creek, and there are plenty of places where you can stop and go hiking along a plethora of trails that will lead you to some attractive waterfalls, including Bridal Veil Falls, Roughlock Falls (accessible via a boardwalk), and Community Caves. 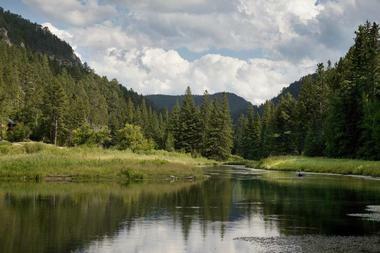 You can also try your hand at trout fishing – it’s said to be excellent. The road is open all year around, and the various waterfalls are particularly lovely in winter when they form frozen ice sculptures. 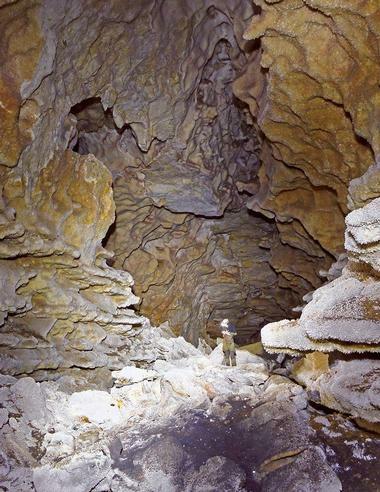 Situated about 13 miles from the town of Custer in the Black Hills, Jewel Cave National Monument protects and showcases the third longest cave network in the world, where you can explore some of the staggering maze of over 180 miles of mapped subterranean passages. Jewel Cave is irresistible to adventurers, explorers, and geologists and, depending on your level of fitness, there are several ways to explore its splendor. The Scenic Cave Tour is considered to be moderately strenuous (lots of stairs), but it follows a paved walkway through several lighted caverns and passages. People with mobility restrictions can take advantage of the shorter, (accessible) Discovery Tour, while dare-devils can tackle the Wild Caving Tour, which requires you to scramble, crawl, and squeeze through some narrow tunnels and passages with your own headlamp. Up on the surface, you can hike several trails, do some bird watching, or admire the wild flower meadows. 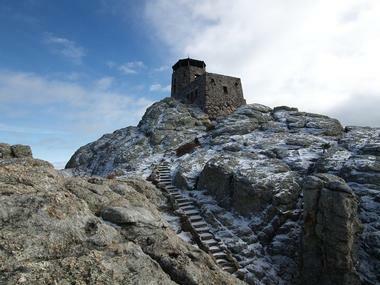 Black Elk Peak, formerly known as Harney Peak, was renamed in 2016 to honor Nicolas Black Elk and highlight the significance of the summit to Native Americans, for whom the peak is a sacred site. 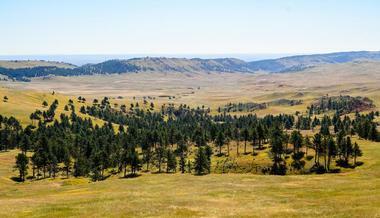 You can find out what it feels like to stand on the highest point (7,242 feet) in South Dakota by tackling the four-mile hike to the summit, which will reward you with sweeping views over the Black Hills National Forest and Custer State Park. You can find the trailhead near Lake Sylvan in Custer State Forest. Expect the round-trip hike to take you around four to five hours along a well-marked and well-traversed trail that starts off gently, but becomes quite steep closer to the summit. Wind Cave National Park protects one of the most extensive and unusual network of caves in the world where you can see unique cave formations found almost nowhere else on earth. You can explore the caves on one of several guided tours to suit all abilities, including introductory tours for Special Needs visitors. The Natural Entrance Cave Tour and the Fairgrounds Cave Tour are moderately strenuous (lots of stairs), while the Garden of Eden Tour is less strenuous and enters the labyrinth by way of an elevator. If you are up for it, you can enroll yourself in the four-hour Wild Cave Tour where you will learn the basics of safe caving under the guidance of a ranger. Above ground you can enjoy camping, hiking, wildlife watching, and ranger-led programs for all ages. Situated just eight miles south of Pierre in central South Dakota, the Fort Pierre National Grassland is an easily accessible recreational area for locals and visitors alike. You can go camping just about all over the Grasslands, but you will need to bring everything you need for dispersed camping as there are no campgrounds. Horseback riding is probably the most popular activity during the summer and you may come across large herds of cattle and buffalo as you canter through the prairie. You can go wildlife watching at several prairie dog towns or see the mating rituals of grouse from the grouse hides. Game bird, prairie dog and deer hunting are all popular seasonal activities. Fishing is great all year round and ice fishing is a big draw in winter. If you close your eyes and imagine a 100-mile stretch of the Missouri River bounded by the untamed American Wild West, you will have a pretty good idea of what to expect at the Missouri National Recreational River. With miles and miles of river to explore, the area is extremely popular for all kinds of water sports – you can choose from boating, water-skiing, canoeing, kayaking, and fishing. Back on dry land there are dozens of hiking and biking trails that follow the meandering waterways, and primitive camping is allowed on some islands and sandbars in the park. If you enjoy hunting, photography, and wildlife watching you will find plenty of scope within this park. 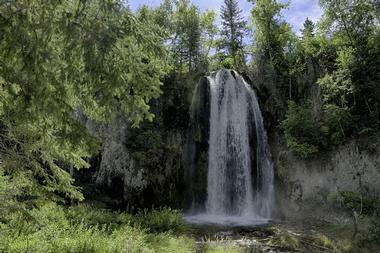 The lovely Bridal Veil Falls are nestled in the Spearfish Canyon, surrounded by beautiful Black Hills landscape. You can reach the falls by taking a drive along the Spearfish Canyon Scenic Byway (US Hwy 14A) – the falls are located about 10 to 15 minutes from the town of Spearfish. You can park along the byway and view the 60-foot falls from a viewing platform alongside the road. You can also reach the falls via a short hiking trail. The falls are usually at their best in spring when Spearfish Creek is flowing strongly, but they are also quite beautiful when they are frozen in winter – when you can access them on snowshoes via the hiking trail. 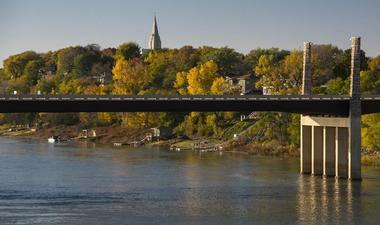 LaFramboise Island lies in the Missouri River just south-west of the city of Pierre, providing an easily accessible green space where visitors can enjoy a variety of outdoor activities. The island is a great place to go hiking, and there are several trails you can choose from, including the interpretive River Trail, which is also suitable for biking. Other activities include all forms of boating (there is a public boat ramp), fishing, and wildlife watching. Bird enthusiasts are in for a treat as the island has a resident population of bald eagles who roost there in winter and spring – some parts of the island will be out-of-bounds during these times. 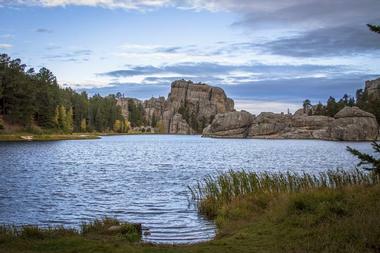 Roy Lake is situated just south-west of Lake City in South Dakota. The park offers locals and visitors a scenic green space where you can get back to nature and enjoy a variety of outdoor activities. The park is a great place to go camping – you can pitch a tent on park your RV in a spacious shady campsite and spend your evenings around the campfire. If you prefer, you can rent basic log cabins with bunk beds for your stay. 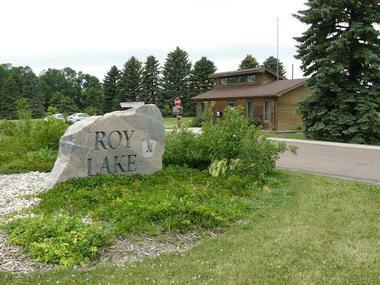 Roy Lake is known for excellent fishing, and there are good facilities for avid fishermen, including equipment hire, a boat ramp, and a cleaning station. You can rent boats, canoes, and kayaks on site, relax on the beach or go swimming and water skiing, or explore the hiking trails. The Richmond Lake Recreation Area near Aberdeen will appeal to all nature lovers, campers, and outdoor enthusiasts. 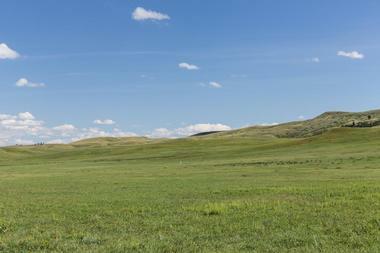 The South Unit of the area offers a campsite suitable for tents or RV’s, and there is also an accessible cabin to rent. 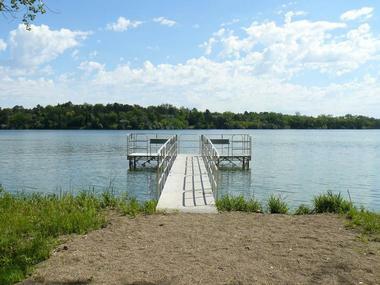 Boating and fishing are popular activities on Richmond Lake – you can make use of the boat launch or fishing pier, and equipment rental is available on site. If you prefer to go hiking and biking, you can take advantage of over 10 miles of trails to choose from, including a bridle trail for horseback riding and a snow-shoeing/cross-country skiing trail for the winter. The 200-acre Forest Drive Unit is great for wildlife watching.